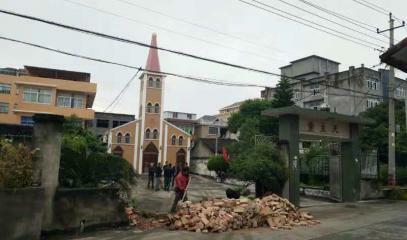 Cross and boundary wall of Lingkun church torn down. A cross demolished in Zhumadian in Henan. It was "too visible". 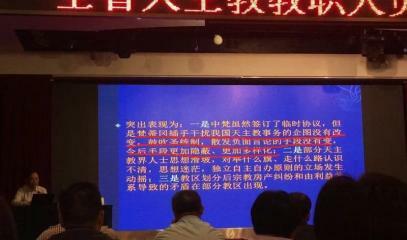 Re-education of priests in Hubei to reaffirm the Church's "independence" from the Vatican and submission to the Party. Rome (AsiaNews) - The "provisional" agreement between China and the Holy See, signed on 22 September, does not seem to have stopped persecution and violence against Catholics. 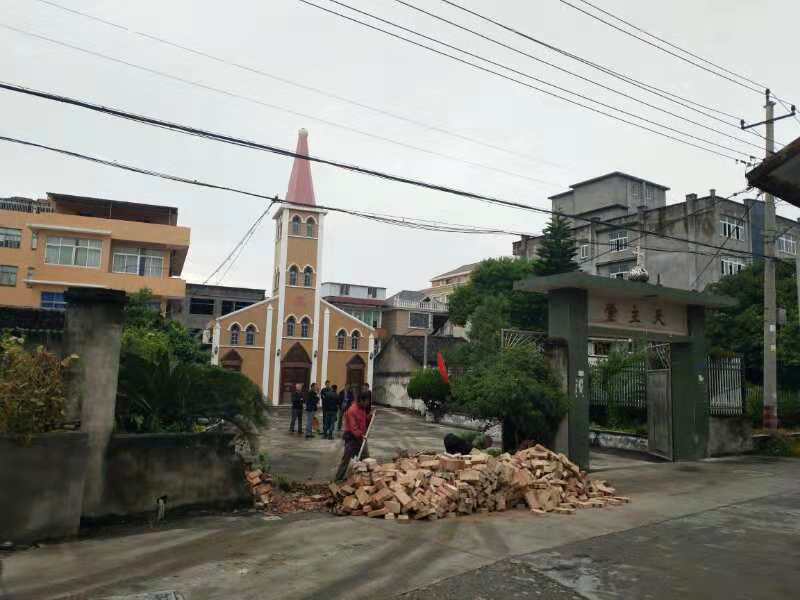 This morning in Lingkun, in the district of Yongqiang, the cross that stood on the bell tower of the Catholic church was torn down (photo 1); the perimeter wall in front of the sacred building was demolished (photo 2). 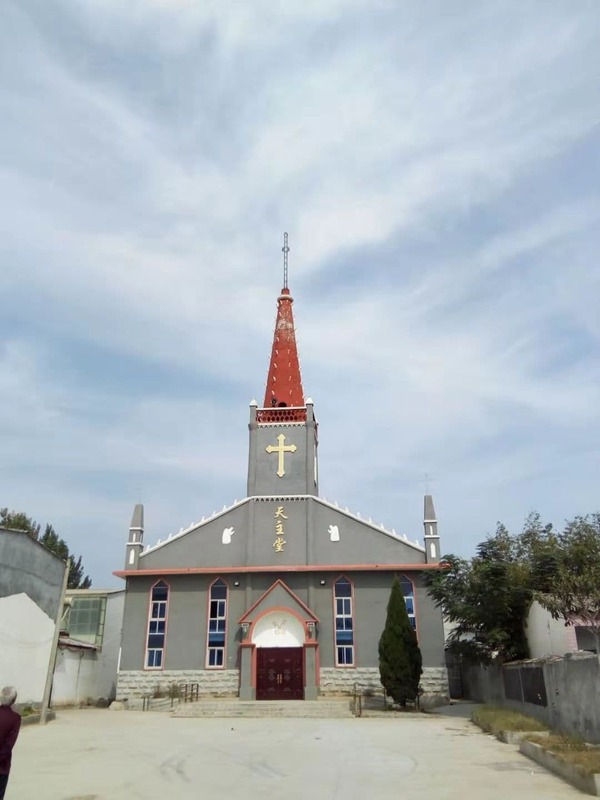 The church is part of the parish of Yongqiang, in the diocese of Wenzhou (Zhejiang). The Catholic community of Wenzhou has about 130 thousand faithful and is led by Msgr. Peter Shao Zhumin, recognized by the Holy See, but not by the government. 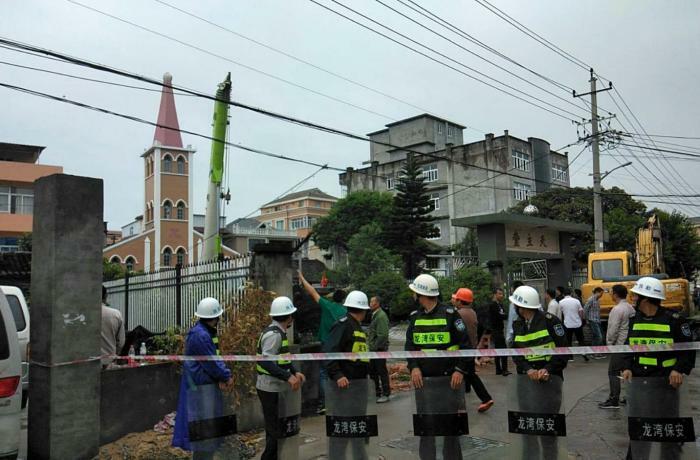 It is the first time that a Wenzhou church has been targeted in four years. The campaign or repression began right in Zhejiang, in 2014, before spreading to many other provinces of China. Lingkun's cross is not the first to be destroyed after the Sino-Vatican agreement. That primacy belongs to Zhumadian, in Henan. 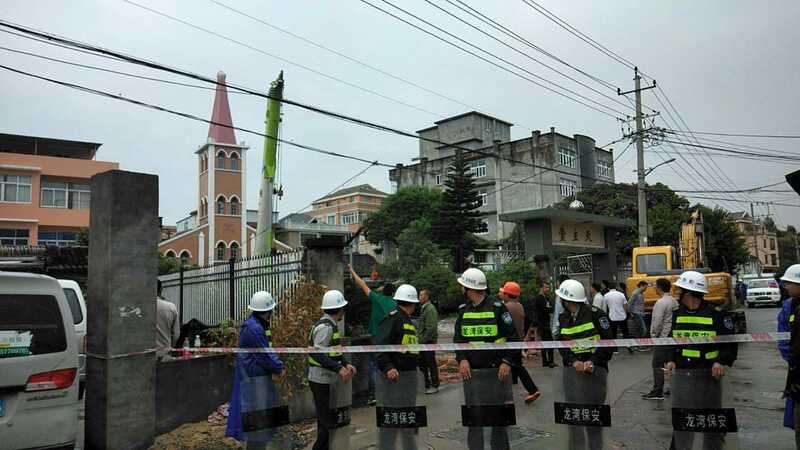 On 3 October, a team of from the United Front workers, le by the United Front provincial deputy chief tore down the church cross because "it was too visible" even from the high-speed train station (photo 3). He said: "It must be destroyed". The United Front is the body that oversees the religious activities. The diocese of Zhumadian has been suppressed by the provincial authorities. It gathers over 60 thousand faithful and is currently without a bishop. Instead its administrator is Fr. Cosmas Ji Chengyi. The violence against Henan is explained by the fact that the province has a high percentage of Christians. Catholics and Protestants total an estimated 10-15% of the population, one of the highest in China, together with Zhejiang. 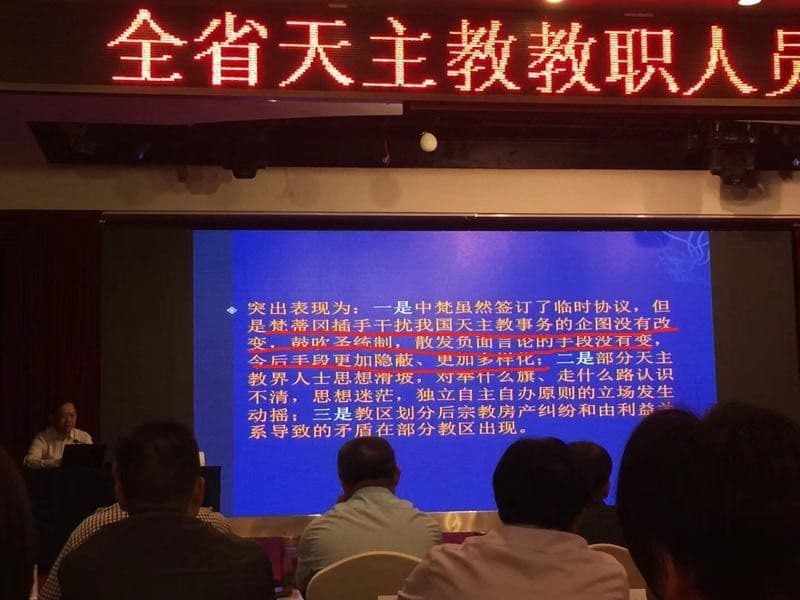 The increase in persecution in recent days is also evidenced by another fact: a meeting convoked by the United Front (and the Patriotic Association) in Hubei to "re-educate the priests". Hubei (precisely Hankow) is the place where in 1958 the first "independent" bishop was ordained, without a Holy See mandate. 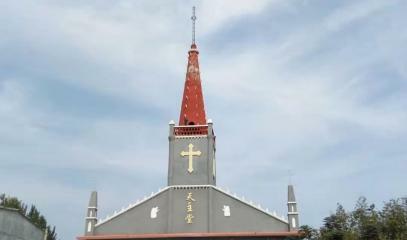 "Hubei, first province with an independent Catholic Church. First, even if China and the Vatican signed a provisional agreement, the Vatican's attempt to interfere with the internal affairs of the Chinese Catholic Church has not changed, calling into question the hierarchical system and spreading negative information. These systems will become even more sophisticated and diversified in the future! Secondly, some Catholics have lost their heads: they are confused about which flag to follow and which direction to take ... '[i], they do not have a clear understanding, the principle of independence and self-government seems to have been forgotten! Thirdly, after the division of the dioceses and the disputes over ecclesiastical property, in many dioceses, arguments and contradictions have arisen because of conflicted interests ". It is interesting to note the third point, in which "disputes over ecclesiastical property" are cited. As we know, one of the main reasons for the close control of the United Front and the bishops by the United Front is to prevent requests for the return of Church property seized in the past by the Party. According to Chinese law they should be returned to their legitimate owners (ie the diocese). But members of the United Front and the Patriotic Association have long since registered these properties in their own name, in contravention of the law. (BC).